It's Showtime (formerly known as Showtime and Magpasikat) is a Philippine noontime variety show that premiered on October 24, 2009, on ABS-CBN. The show broadcasts from the ABS-CBN Studios at the ABS-CBN Broadcasting Center in Quezon City. The show airs Weekdays from 12:15 pm to 3:45 pm, Saturdays from 11:30 am to 3:30 pm, and encore telecast on Jeepney TV every Mondays to Saturdays from 8:15 pm to 11:00 pm starting on June 11. The show also broadcast worldwide through TFC or known as The Filipino Channel. On October 24, 2009, Showtime premiered as a morning competition program, airing before the network's noontime shows, and served as the replacement for Pilipinas, Game Ka Na Ba? following its successful 8-year run. The original cast consisted of Vhong Navarro, Anne Curtis, Kim Atienza, Jugs Jugueta, Teddy Corpuz, and Vice Ganda as the permanent judge. During the third season, the show added previously evicted judges Billy Crawford and Karylle as hosts. In its first four seasons Showtime's competition format was that three groups, each made up of two to twenty-five members (with no age limit), perform a single performance, either a song and/or dance number. After the group's performance, the judges give a collective "yes" or "no" to the group. If the judges give a "yes", the group is considered part of the main contest, with the judges' scores of the group's performance included in the calculation of the winner. A "no" means exclusion of the group from the main contest. This segment was removed during season 2. In season 3, during the February 16, 2011, episode the segment returned, but with no random selection. Instead the group automatically performs on stage. The group with the highest average score from the judges wins and proceeds to the weekly finals. All winners throughout the whole week perform in the weekly finals. Whoever wins in the weekly finals gets the chance to compete in the monthly finals. Lastly, all the monthly finalists compete in the season's grand finals. Aside from the talent competition, Showtime also aired quick, short-term segments that offer cash prizes to the studio audience. On January 15, 2011, the show was moved to the noontime slot temporarily. It returned to its original time slot on February 12, 2011, to give way for Happy Yipee Yehey!. On January 28, 2012, the show aired a special episode to end its two-year competition format as Showtime, and ended with an impartial farewell. On February 6, 2012, it is reformatted as a noontime variety show. It's Showtime was also aired previously on Studio 23 (now ABS-CBN Sports and Action) and CgeTV's website during its relaunch week. Showtime ended its pre-noon time slot run on January 28, 2012, to prepare for a reformat as a noontime variety show which premiered on February 6, 2012, in its new timeslot, 11:30 am, replacing former noontime program Happy Yipee Yehey!. The show retained all of its hosts, including Vice Ganda, while adding former judges Jhong Hilario, Ryan Bang and Coleen Garcia. Eric Tai was also added as a new host during the pilot episode. 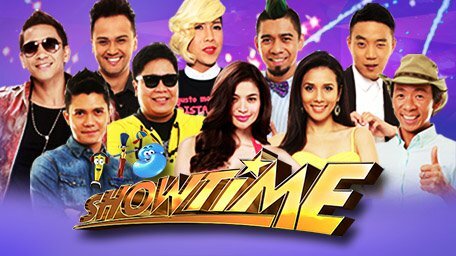 It's Showtime aired new long-term segments, while the competitive format returned once again as one of its segments. The competitive format was used for one final season, season five. To cater to the entire family audience, a new competition called Bida Kapamilya was introduced on April 30, 2012, as season six. Throughout the run of Bida Kapamilya, It's Showtime added Joy Rendon (May 19, 2012) and Rhed Bustamante (October 27, 2012) as part of the cast. Amy Perez and Mariel Rodriguez were added to the show's main hosts on January 15, 2016, after guest co-hosting in December 2015. Coleen Garcia was dropped from the program because of her acting career and was briefly replaced by Joey Marquez. Meanwhile, Eric "Eruption" Tai left the show to focus on his sports career and married life. Jhong Hilario temporarily left the show on March 23, 2016 to run for councilor in Makati City; he reprised his hosting duties on May 10, 2016. On May 13, 2017, the show announced that James Reid and Nadine Lustre were added to the show as co-hosts for a brief period of time. Mariel Rodriguez returned on June 18, 2018 after a two-year-long break.